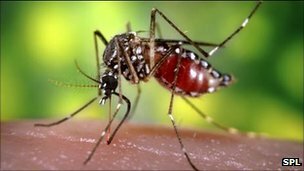 Mosquitoes “disappearing” in certain parts of tropics and “appearing” in an usual parts of the earth ? The New era mosquitoes are manifesting in areas they are not used to be seen before. Like this summer in Thailand seems most of the mosquitoes disappear almost in Bangkok. Many attributes to the climate change . We invite you to read the following articles to make your judgments and give us your experiences in your region . Is the mosquito menace growing in the UK? But a team of Danish and Tanzanian scientists say this is not the whole story. For more than 10 years they have been collecting and counting the number of mosquitoes caught in thousands of traps in Tanzania. In 2004 they caught over 5,000 insects. In 2009 that had dropped to just 14. More importantly, these collections took place in villages that weren’t using bed nets. One possibility for the reduction in numbers is climate change. Patterns of rainfall in these years were more chaotic in these regions of Tanzania and often fell outside the rainy season. 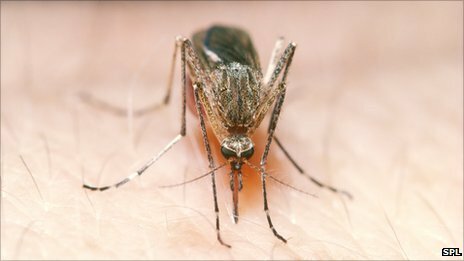 The scientists say this may have disturbed the natural cycle of mosquito development. But the lead author of the study, Professor Dan Meyrowitsch from the University of Copenhagen, says that he is not convinced that it is just the changing climate. “It could be partly due to this chaotic rainfall, but personally I don’t think it can explain such a dramatic decline in mosquitoes, to the extent we can say that the malaria mosquitoes are almost eradicated in these communities. The research team also found anecdotal evidence that their discovery was not an isolated case. Prof Meyrowitsch added: “Other scientists are saying they can’t test their drugs because there are no children left with malaria. The researchers are unsure if mosquitoes will return to these regions. If they do, one particular cause for concern is the young people who have not been exposed to malaria over the past five or six years since the mosquitoes began to decline. What could we learn from Joey Barton? Can you calculate the world’s best sportsperson? Do rewards help capture the world’s most wanted men? Complaints of mosquito bites are on the rise in the UK. So should Britons brace themselves for a future mosquito menace? Hovering perfectly at ear level with a lingering, bothersome whine, mosquitoes leave you with bites that lead to itchy, swollen welts. In much of the world, affected by malaria, repelling them is a matter of life and death. In the UK they are a mere annoyance, interrupting summer holidays and barbecues. Based on a survey of UK local authorities, reports of mosquito bites over the last 10 years are 2.5 times greater than in the 10 years up to 1996. NHS Direct statistics show 9,061 calls in England complaining of bites and stings from early May this year to now – up nearly 15% from last summer. Not all bite complaints are due to mosquitoes – many can be attributed to bedbugs, midges and fleas. But conditions in the UK, particularly in southeastern England, are increasingly hospitable to mosquitoes. “The wet weather through May and June this year, along with a warm summer, has affected the population because mosquitoes like the standing breeding water,” says zoologist Michael Bonsall at Oxford University. It’s difficult to track mosquito numbers accurately, but the UK authorities are trying to do so. The Health Protection Agency has organised the Mosquito Recording Scheme to look into where and how mosquitoes live and breed. And the Chartered Institute of Environmental Health, with help from the HPA, has created Mosquito Watch, a voluntary reporting system geared towards collecting and analysing various specimens. Not only do mosquitoes swarm over pools of standing water, including bowls left outside for pets, they appear under man-hole covers and even travel on London’s Tube network. But while mosquitoes transmit deadly diseases in many parts of the world, they do not cause major harm in the UK. They may spoil picnics in the park, but they are usually only a major problem when Britons travel to countries with malaria, dengue or other mosquito-borne diseases. But once upon a time, malaria-carrying mosquitoes could be found in the salt marshes of southeastern England. It is believed that malaria – literally “bad air” – dates back at least to Roman times in the UK, and outbreaks occurred as recently as the years just following World War I.
British doctor Ronald Ross, who discovered the malarial parasite living in the gastrointestinal tract of the Anopheles mosquito in the 19th Century, recruited teams to eliminate the larvae from stagnant pools and marshes. Malaria in England had effectively died out by the 1950s, mostly due to the draining of much of the marshland where mosquitoes bred. But because of the growth of global travel, the number of imported cases of the disease in the UK has risen, with nearly 2,000 a year today. In many cases, live mosquitoes have been found on aircraft, or travelling in luggage, having been transported from countries with malaria. On rare occasions, people may even have contracted malaria in Europe and North America, dubbed “airport malaria”. Five of the 30-plus species of mosquito found in the UK are not native. One variety is coming alarmingly close to the UK. 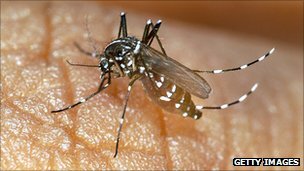 The Asian tiger mosquito – Aedes albopictus – known for its white and black striped pattern has been spotted as close as Belgium. While the species does not carry malaria, it does transmit West Nile virus, Yellow fever and dengue. “It is possible that Aedes albopictus could make its way to the UK,” says Dr James Logan, medical entomologist at the London School of Hygiene & Tropical Medicine. “Because they lay their drought-resistant eggs in transportable materials, like used tyres, there is a possibility that they can be transported to a country where they are not normally found. Bonsall agrees and adds that predictive models show how malaria-carrying species could even make their way to areas such as the North Kent marshes, Essex, Norfolk and Suffolk. Mosquitoes are becoming immune to the insecticides used to treat them – via spray or bed nets, according to a recent study from Senegal. Between 2007 and 2010, insects with a resistance to a popular type of pesticide rose from 8% to 48%. “This could be a big problem for future control,” says Dr Hilary Ranson, head of the vector group at the Liverpool School of Tropical Medicine. But according to Dr Logan, the health infrastructure and access to drugs in the UK means malaria is unlikely to take hold and cause major problems. Unlike much of the world, the rise of the mosquito will be a nuisance in the UK rather than a serious threat.